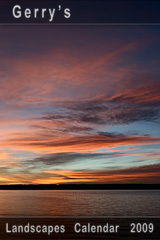 Select from more than 25 fantastic photographs and artwork. Really big high resolution images 900 pixel wide. Save the greeting cards to your photo album for later reuse. Choose from more than 25 templates. Type in up to three lines of personal text. Save the card to your photo album. 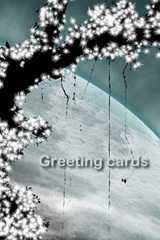 Open the photo album, select your designed card and send it per email. Feeling bored with usual calendar applications? Ever wanted to have something special, exciting, pleasing, something like a portable wall calendar? 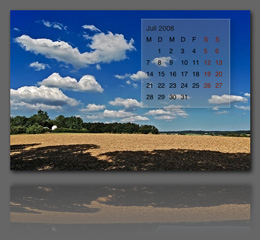 Landscapes Calendar 2009 brings to you 64 high quality landscape views as calendar sheets. 16 thematically arranged photographs per season in random order lets you discover another secret beauty of the bavarian landscapes each time you dive into it. 64 hight quality photographs of one of germanys leading landscape photo-artist. 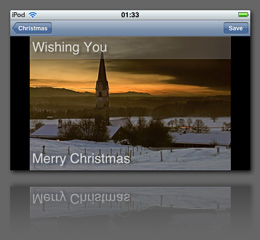 An exclusive selection, specially edited for iPhone/iPod Touch. Position the calendar with your fingertip. The position will be saved for each image individually. Have fun sliding the calendar sheet to advance the calendar. Available in the AppStore, get it now!